Ask a straight question and you’ll get a straight answer. There is some independent confirmation that the Greek referendum of the 5th July confused voters into producing a non-sensical result. An interesting article by Nick Baltas provides additional theoretical perspective for the analysis presented in this blog last week. He explains the mental process in voters’ minds by referring to psychologist Daniel Kahneman’s concept of “attribute substitution,” a mental shortcut that leads people when presented with a complex question to substitute it for a simpler one. In more tangible terms, an opinion poll published today appears to totally invert the “No” outcome of the referendum. Given the choice between “a deal with tough terms with the creditors” vs. “no deal and default / exit from the Euro” what position would you personally take? Respondents answered 70% in favour of a deal. 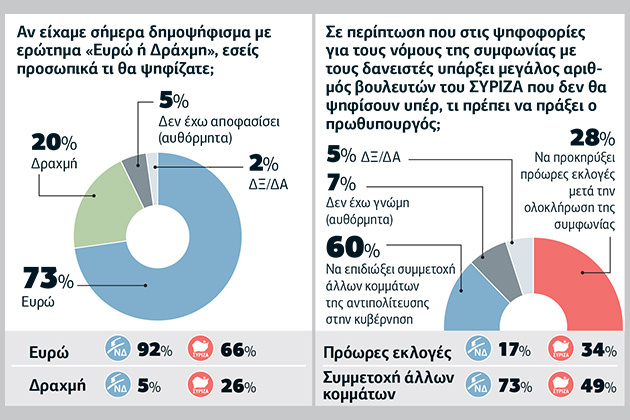 To the question “If a referendum were conducted today and the question was ‘Euro or Drachma’ which way would you personally vote?” 73% respondents voted for the Euro. 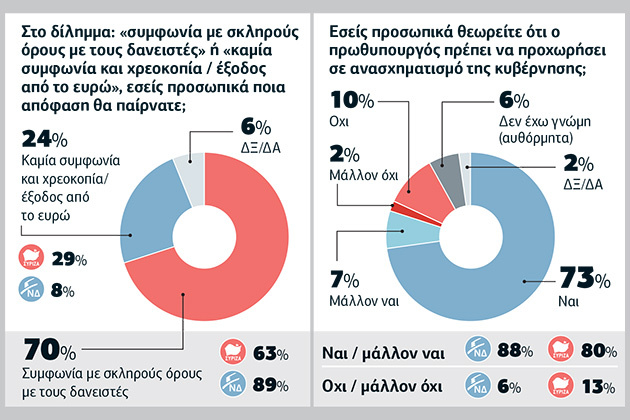 At the same time, voting intentions indicate that Syriza would win an outright majority with 42.5% of the popular vote if elections were conducted now. It sounds very much like voters want a confident Syriza to pursue a pro-Euro, pro-agreement strategy. It will be interesting to see whether they rise to the occasion. Yesterday’s reshuffle suggests that they are biding their time until elections to shed the naysayers. In that case, the crucial question is whether there is enough intersection between the intending Syriza voters and the Euro/deal supporters (63-66% of Syriza supporters back these options according the survey) to put them in power with an enhanced mandate, or whether a few months of a coasting, inexperienced and divided government tasked with a critical mission will prove their undoing.